We may often hear about domain authority, and how it affects a website, but do we really know the ins and outs of domain authority? 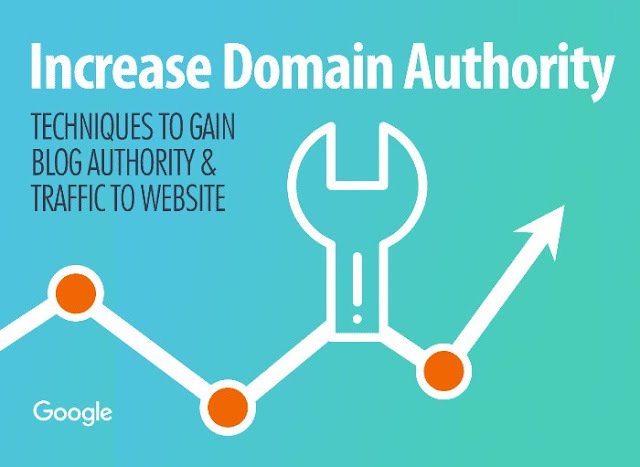 How it works, and how to effectively increase the domain authority for a website. Domain authority is a metric website that is a measure of the trust of a site or website based on referrals that come from search engines and users, as Moz has developed, domain authority is an important factor that affects traffic and ranking of a website, because domain authority is a reference or barometer of the trust level of the site itself. Many SEO experts say if this domain authority is a reference to how Google gives a page rank to a site. But there are also those who think if this is not entirely true. Indeed, there are many pros and cons about this domain authority, but what we need to look at is that sites that have a high page rank must have very good domain authority values. So that we can conclude, that domain authority is one of the many factors or barometer of the level of trust in search engines to a site or website. If we already know and understand what a domain authority is, and how it works and its influence is very significant on the website that we have, then what we have to learn next, is how to increase the domain authority so that it has a significant influence on the website we have. Some steps that will be outlined below, need to be run continuously, so as to give a big influence to the domain authority of our website, which in the end, will affect the traffic and website ranking that we have. Maybe this is the basis of everything that we apply to improve this domain authority, the right technique will produce something far better, for this reason it requires in-depth research and trial and error techniques to ensure that the SEO techniques that we master are appropriate, or right on target, so that nothing is wasted or consumed a lot of energy. Technical details about SEO, such as the structure of a website, breadcrumbs, URL structure, meta tags, header tags, word count, keywords, etc. must be mastered, because this is the foundation for improving domain authority. Quality content is a backbone of increasing domain authority, not only based on the quality of content, but also content that contains things that are informative, out of the box but still in the corridor that can be accepted by logic and common sense. In-depth research needs to be done before developing a content, very detailed content, content that is interesting and unique, fresh, and content that is evergreen or enduring, in accordance with the context of the age of development, is a very big influence on the quality of content. The following is an article that contains tips on creating quality content. Promoting quality content through various available channels, such as through social media, paid social media services, or via email from the database that we have, and creating quality promo content are things that can help us in promoting the content contained in the website. Social media is one medium that can affect the exposure to the brand and website that you have. With the right social media strategy, you can increase the domain authority of the website you have. Improve your company's social media profile, use the right design to build your business credibility, promote your social media regularly on the website you have. In essence, you cannot get rid of the role of social media in increasing the domain authority of your website. Check out our article about engaging customers on social media. Why branding can be said to be an important milestone in increasing domain authority, because when in the mind of the target market your business has embedded everything related to your brand, then like it or not, or like it or not, surely they associate it about your business website. In short, the right branding strategy can help expose your website content, so that it can be accessed by market share or a wider audience so that it will make more powerful backlinks. Now we have touched on things that have a very direct and significant impact on the domain authority. One way to increase domain authority is to make a lot of backlinks in every content contained in the website that we have, but what needs to be underlined is that the backlinks we enter must be natural, without intending to trick search engines or spamming, because if you manipulate search engines, we can be sure that domain authority will never be obtained. Tips on building quality backlinks in our article may be useful for you. Strong internal links, creating a strong network between users and search engines so that in the end it will impact on your website's ranking and traffic. Sites that have strong internal links will also have strong interconnections so the website will become unbreakable. By creating lots of content, it will automatically create internal links that can be linked to every content we make. Many kinds of online SEO can be applied, starting from the technique of creating content, placing keywords, making friendly txt robots and making meta tags on the blog template. The more often your blog is crawled by search engines, then you can be sure your website is liked by the search engine, and the domain authority will flow up significantly. Why can strengthen relationships between website owners affect the domain authority? Because, if the website owner links the link contained on your website, it will indirectly increase the domain authority. Simply put, a good relationship is directly proportional to the increase in domain authority. It is indeed not easy to routinely and continuously clean up links that are indicated by spam and have bad consequences for our website, but this is very important to improve the domain authority of our website. All the methods outlined above depend on our level of consistency. It is necessary to implement a routine, periodic and continuous schedule in carrying out the methods above. The thing that is rarely noticed in any discussion about the domain authority is, things related to the age of a domain. The longer the age of the website domain, it does not automatically increase the domain authority of the website. There are other things that determine, such as often or not a site or website has improved, outdated SEO techniques, bad link profiles, and lack of fresh and quality content. Along with maintained consistency, then along with the increase in your website's authority domain. Be patient, because SEO doesn't show results overnight, it takes a long trip before you finally pick something very sweet. You will find many ways to increase the domain authority on other websites or sites and some of them are very good, like here, you only have to practice this, do that and so on. But what you have to remember and not to forget the main point, all must return to the big picture about SEO today, namely content marketing. You can win the competition - domain authority, website traffic, organic search results, and ranking - by directing the full focus on the content of your website.